The US is now the world’s largest producer of oil and natural-gas. This new reality was primarily facilitated by technology advancements in horizontal drilling and hydraulic fracturing which enabled economically viable production from unconventional sources such as low-permeability shale formations. As this production has increased over the past decade or more, so too has the responsibility to identify and manage the potential risks to communities and the environment. This responsibility has historically rested primarily with state regulators but as the scale of this production has grown and expanded into new regions – many of which with limited resources and experience to cope – and better knowledge of the potential risks has developed, the governance primacy of the states has been challenged. In spite of these challenges, much of the governance of shale development is likely to continue at the state level. State oil and gas regulators seek to balance a complex set of competing interests among their many stakeholders, including communities, industry, and political officials at all levels. State regulators often have a long trust relationship with industry, having worked together for decades to identify and resolve issues, with and without regulatory action. States also work with each other (e.g., through initiatives such as States First) to share experiences, compare rules, conduct peer reviews, and adopt regulatory innovations. However, when it comes to working with federal regulators, particularly the U.S. Environmental Protection Agency (EPA), there presently appears to be a significant lack of trust and a lengthy list of frustrations. State regulators and industry actors complain about distant, unaccountable federal bureaucrats dictating what should happen in states through a slew of lengthy, confusing, inflexible regulations based on ideological agendas and insufficient consideration of varied on-the-ground realities. There is a clear shortage of social capital and personal relationships between the different levels of government, as well as between the federal regulators and industry. Government and governance are not the same thing. Government often refers to a governing body, while governance often refers to the framework of governing – both architecture and process. 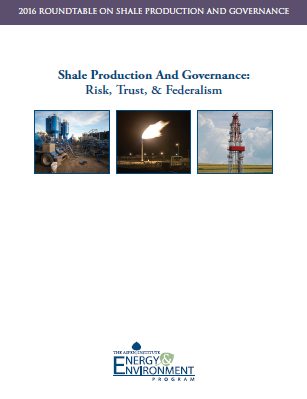 Examining the governance involved in shale development can uncover more effective ways of identifying and responding to technical, political, and social risks. Examining governance involves exploring the operation of the multi-level, multi-actor networks of formal and informal institutions, including governments, non-governmental organizations, and market actors that are involved in shale development. This examination also involves assessing the structures and processes those institutions have in place to assess and address risks, allocate costs and benefits, adapt to changing circumstances, engage stakeholders, and foster trust and accountability. Theories about the elements of best-in-class governance can also be useful. These theories can help illustrate how regulatory decisions depend on the competence, engagement, and integrity of individual regulators and their decisions should ideally be based on objective data and scientific analysis, listening empathetically and respectfully to people, and ensuring people feel a sense of procedural justice. Pursuing the elements of best-in-class governance can be especially helpful in part because different actors intersect with, define, and respond to risks in different ways. Some focus on risks to the environment and public health, while others more acutely feel risks to ideology, lifestyle, and value systems. People and organizations also approach their understanding of factual claims with non-factual background assumptions and frames of reference (e.g., values, culture). Even if all the facts are agreed to, the values, principles, and preferences underlying risk management choices – such as whether to address the biggest hazards or the most likely risks, or whether to use regulations or voluntary measures – determine what decisions are actually made. With regard to governance and risks, both facts and values can be contested. Building a more nuanced map of the risk landscape can help an entity craft a more sophisticated governance pathway through it. There are many challenges to achieving the idealized vision of governance most regulators and industry have – of regulatory decisions being based not on politics and ideology but rather on science and data. For example, regulators have to address many issues that are rife with uncertainty and judgment calls. Even where science theoretically could help, many scientists do not focus on science that regulators and other decision-makers need to address real-world issues. Where there is science available, the studies can be flawed or biased. Regulators are also struggling to absorb the huge volume of data being generated and make it manageable and useful. Even if the science and data are good, they might not be trusted, understood, or correctly interpreted by the public. The reality is that people often make decisions based on information that accords with their pre-existing beliefs – and that, in turn, drives politics and policy. Science and data play a role, but emotions, values, heuristics, and biases dominate. Still, data and transparency will only become more important, whether to create metrics that can track outcomes or to provide tools that companies can use to better engage with communities. Further, communicating with communities and building trust with the public are continual, central challenges for regulators and industry. Growing populations in certain shale plays and the proximity, intensity, and scale of horizontal shale development are spurring a great deal of community concern about traffic, dust, noise, and other nuisances that accompany shale development on an industrial scale. Adding to community concerns is a perceived imbalance of power, where community members do not feel on equal footing with oil and gas operators or with the state when it comes to decision-making. State regulators can pursue a range of approaches to try to build trust with communities, including teaming up with other parties that are trusted for certain purposes (e.g., universities for research), enacting and enforcing strong regulations, being accessible to all (including hostile crowds), creating governance structures that bring in a broader range of stakeholder input, and building personal relationships with communities and local officials. Companies, in turn, have to protect their social license to operate by engaging with every community in ways highly customized to each community and to what the company is building or operating. Some companies communicate poorly with communities, dismissing risks in ways that provide no comfort to emotional, worried people. Respectful engagement and empathetic listening are key. In the end, however, the effectiveness of any community and public engagement effort by regulators and industry seems to depend heavily on the audience being targeted. There are three almost entirely different groups involved in public conversations about shale development: (1) the people in communities where shale development is occurring who have legitimate concerns about nuisances; (2) the anti-fracking and divestment movements that oppose fossil fuel corporations and worry about climate change; and (3) the broader public. The first group is seeking to have their concerns about “fracking” addressed. The second requires the industry to be non-defensive, patient, positive, and proactive. The third could be engaged in adult conversations about energy preferences, including the benefits of fossil fuel production (e.g., improving the lives of the poor) and how climate mitigation and adaptation are pathways to a different discussion about the management and use (but not elimination) of hydrocarbons. The complexity and polarization of the shale conversation suggests the need for a different way of framing the conversation. Future Aspen Institute convenings on shale production could seek to identify and explore the core challenges of building trust, communicating about risk, and engaging the public. A more frequent Aspen Institute dialogue that aims to produce some kind of findings, recommendations, or regulatory elements could also be valuable, perhaps focused on the challenge of prioritizing the long list of issues regulators have to address or on the strained federal-state relationship. 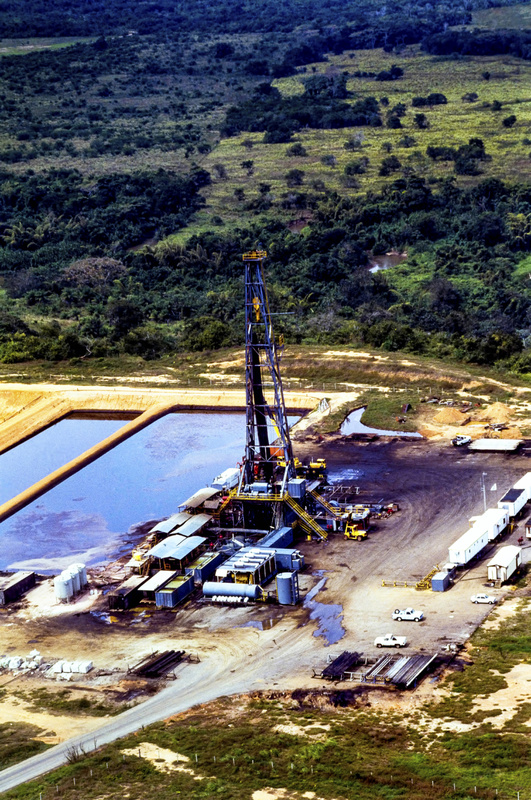 Shale production does not exist in a single centralized governance structure – it involves several levels of government, crosses numerous states, and involves a range of heterogeneous entities – which results in profoundly different governance architecture, roles, and process across the various shale plays. Regulators at all levels of government, researchers and operators need to work together to determine what data about shale production is actually needed, how often, and in what form in order to better interpret risks, rack progress and develop metrics that can track and verify progress. Community concerns about shale production and governance often correlate to distance from royalty checks and are often exacerbated by a perceived imbalance of power, where community members do not feel on equal footing with oil and gas operators or with regulators when it comes to decision-making. 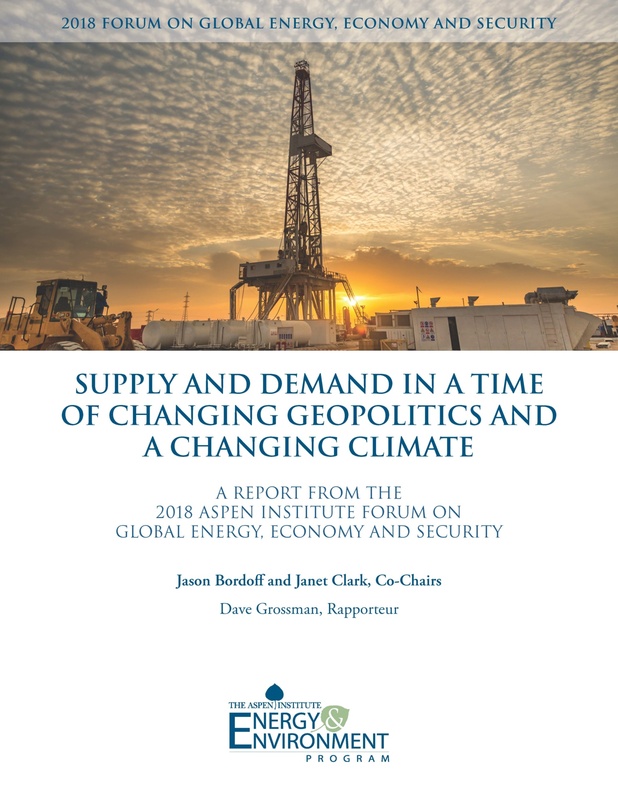 Natural gas from shale can help achieve near-term climate policy goals and discussion focused on climate mitigation and adaptation are pathways to more productive discussion about the management and use of natural gas. Findings, and/or recommendations from an Aspen Institute dialogue process prioritizing regulatory action for various jurisdictions and identifying regulatory elements necessary to foster an enhanced relationship between federal and state regulators could be quite useful especially given pending changes in federal and state leadership.